This Linux machine weighs less than 3 pounds and can be configured with various Kaby Lake processors, including the Intel Core i7-7500U, up to 32 GB RAM, multiple storage options, and more. The prices start at $899 USD and can go much higher, depending on the hardware setup. System76 has recently unveiled its plans to begin designing and manufacturing its own hardware, but some time will surely pass until that happens. 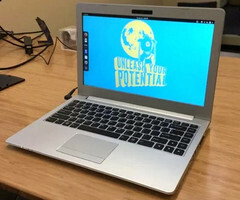 In the meantime, the company's Galago Pro light notebook is almost ready to ship, and pre-orders can be placed for various hardware setups of this Ubuntu-driven portable. The System76 Galago Pro ultrabook starts at $899 USD, this price covering a configuration that includes the 3.1 GHz Intel Core i5-7200U processor, 4 GB DDR4 RAM, 120 GB M.2 SSD storage, as well as a rich set of connectivity options - WiFi, Bluetooth, HDMI, Thunderbolt 3, USB 3.1, and more. However, a more powerful hardware setup that does not include ridiculous options (including a 2 TB NVMe SSD drive, for example, would add $1,449 USD to the price tag) can easily hit the $1,500 USD barrier. We configured the Galago Pro with the 3.5 GHz Intel Core i7-7500U, 8 GB RAM, a 250 GB NVMe SSD drive, a faster WiFi + Bluetooth adapter, also choosing to get the three-year warranty instead of the standard one-year. The resulting Galago Pro notebook has a price tag of $1,467 USD. Those interested can go to System76's website and configure their Galago Pro as well. Shipments are expected to begin in May.